Tax laws are ever changing. In order to take advantage of money saving opportunities, it is crucial to be up-to-date on tax news that might affect you. Here are some relevant articles to keep you well-informed on current tax issues and links to the useful websites. Special Links | Links to various governmental websites, tax forms, tax rates, etc. 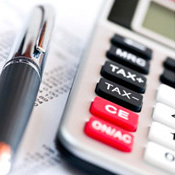 Financial Calculator | Become better informed on your mortgage payment options.